In 1840, the rich Greek of Diaspora, the Baron George Sinas, who was also Consul of Greece in Vienna, discussed with his friend Prokesh-Osten, Ambassador of Austria in Athens, about what could he offer to contribute to the development of the newly founded Athens' University. Prokesh-Osten, who during 1837 had at his service as translator the physicist and astronomer George Vouris, proposed to Sinas to contribute to the foundation of an Observatory. The King Othon gave to Sinas the higher State decoration and he was personally involved in the foundation. He asked the Architect and town-planner of Athens Eduart Schaubert to furnish the plans. As for the place, the hill of the nymphs, place were the first Athenian astronomer, Meto, observed during the antiquity, was finally chosen. The approved plans of the Observatory made by Schaubert's collaborator, Theophil Hansen were of a pure neo-classical style. One can admire today the symmetry of this beautiful building, recently restored, constructed with materials recalling Ancient Athens: stone from the hill of the nymphs, cyan marble from Hymettus, white marble from Penteli. The symbols are those of Ancient Greece; Ancient Greek astronomers are painted and around the dome the twelve Gods of Olympus. The main building was completed in 1846 and observations begun in September 1847, under the direction of George Vouris (1847-1855). 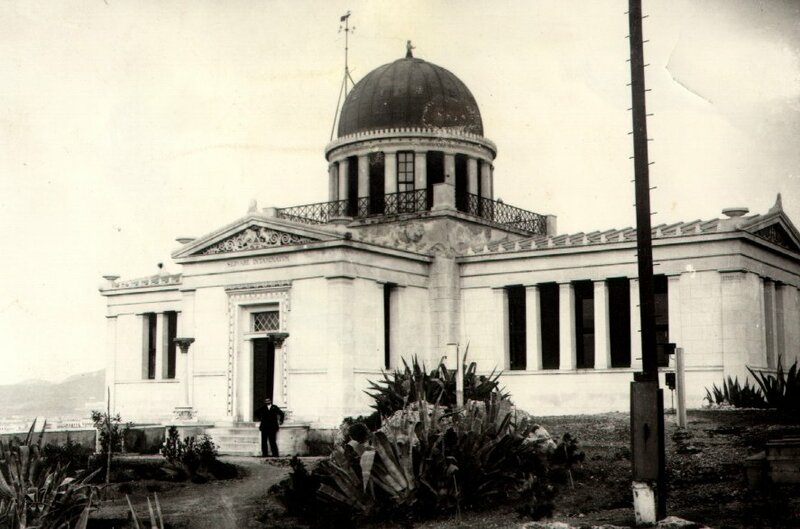 The case of the Observatory of Athens was, until the end of the 19th century, that of a main State institution depending almost entirely on private funds. Except the salary of its first director, George Vouris, paid by the State, as he was also a professor of the Athens' University, all other expenses were covered by Baron George Sinas. After George Sinas' death in 1853, these expenses were covered by his son Simon Sinas and after the death of this later in 1876, by his wide Ifigenia. The family Sinas paid also the salary of the third and the most important during the 19th century director, the German Julius Schmidt. George Vouris who travelled in Vienna for that purpose ordered the first instruments of the Observatory during 1845. From then on and until 1852, Vouris paid several visits to Europe to order more instruments and make contacts, all expenses covered by George Sinas. After that date, there will not be some important new order until the last decade of the 19th century. These first instruments will be restored in 1861 at the request of Julius Schmidt and as usually Sinas family covered the expenses of that restoration. These first instruments are: A Ploessl equatorial refractor of 6.2 inches aperture, a Starke - Fraunhofer transit circle of 3.7 inches aperture, one Berthoud mean time clock and one Kessel sidereal time clock, five small telescopes for comet hunting, two barometers Kapeller and a set of other meteorological instruments. After G. Vouris' retirement in 1855, John Papadakis was appointed director until Schmidt's arrival at 1858. Friedrich Julius Schmidt has been a very active director until his death in 1884: he made systematic observations of Sunspots, Comets, Minor Planets, Variable Stars, and also meteorological and geophysical observations. His main achievement has been the Topographic Map of the Moon, published by the Prussian Academy. He published the Publikationen der Sternwarte zu Athen. After Schmidt's death, his collaborators Demetrius Kokkidis took charge of the Observatory up to June 1890, when Demetrius Eginitis was appointed director by special decree. Eginitis has been eleve-astronome at the Observatory of Paris (1987-1890). Under Eginitis' direction, the Observatory was completely reorganised. He founded an important net of meteorological and seismological stations all over the country constructed new buildings and acquired new instruments, having obtained important donations. In 1896, a National Committee was founded under the direction of Prince George to provide funds for the renewal of the instruments of the Observatory. The Committee obtained 250,000 Drs from Greeks of the Diaspora as D. Dorides, A. Syngros, M. Koryalenios, P. Stephanovik, E. Zarifis, K. Mavromikhalis, A.Skouze, N. Chrysovelonis. With this money, Eginitis expanded the Observatory and acquired in 1896 the great transit circle of Gautier, 15 cm aperture and 2 m focal length (named after Andreas Syngros), and in 1900 the big equatorial Gautier of 40cm aperture (named after Dimitrios Dorides). C. Ionides gave his private telescope, an equatorial reflector Browning of 20 cm aperture. Demetrius Eginitis has been the more long-lived director of the Observatory: he ruled this institution during 44 years, i.e. until his death in 1934. Eginitis has been an important person in Greek political and academic life: he has been twice Minister of Education (1917 and 1926) and founded the Academy of Athens (1926). He published the 12 volumes of the Annales de l'Observatoir National d'Athenes. The Observatory of Athens possesses also a very important telescope of the 19th century, gift of England during the 1950's. It is the big Thomas Cooke refractor of 63 cm aperture, made in 1869 for R.S. Newall, Esquire of Gateshead, who offered it in 1890 to the University Observatory of Cambridge. The Newall refractor was transported to Greece in 1957 and installed in the Observatory of Penteli, at the north of Athens, in a special dome of 16 m diameter with a rising floor, built to house the instrument. For up to date information on the National Observatory of Athens, please consult it's web site.